The Powdermill Stream is a tributary of the Combe Haven catchment in East Sussex, set in rural countryside with historic Battle to the north and the village of Crowhurst to the South. A large proportion of the Powdermill catchment is within the High Weald Area of Outstanding Natural Beauty (HW AONB) which is a nationally protected landscape. 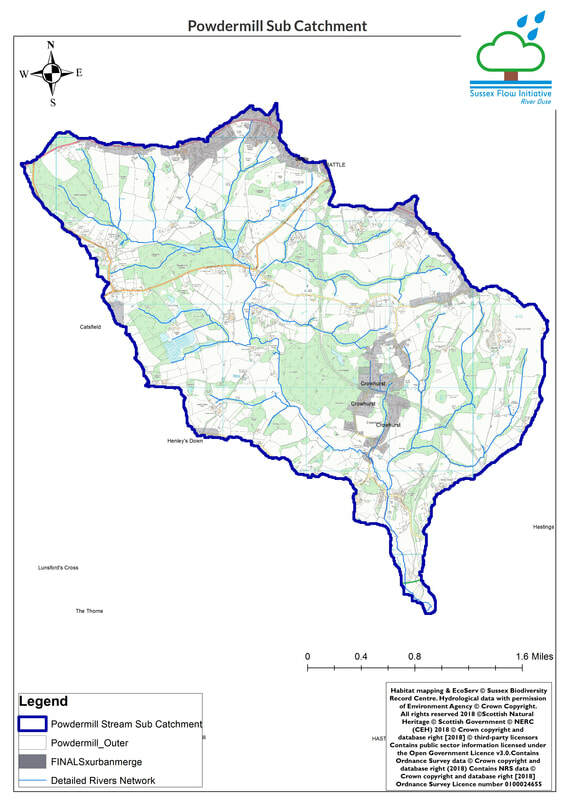 The total catchment area above Crowhurst is around 1,770 ha, and the Powdermill stream sub-catchment comprises around 6.3 km of main river, 4.2 km of secondary stream and 26.5 km of tertiary (head)stream. Much of the landscape is farmed with arable and agriculturally improved grasslands, but there are also large areas of important meadow and ancient and ghyll woodlands. The Powdermill catchment is naturally steep and fast flowing. Localized flooding to properties in Crowhurst has occurred regularly in recent years. Flooding has been caused by storm and surface water run-off from the road network and urban surfaces, flooding from rivers and streams, and water backing up behind high tides at Combe haven. During times of high rainfall, too much water flows down the river too quickly, and creates flood surges which cause risks to people and property. So far, engineering solutions have not been able to fix the issues with flooding, so in 2017 a partnership was formed between Sussex Wildlife Trust and the Environment Agency to try and find natural solutions to slow down flood water across the catchment. It is hoped that Natural Flood Management (NFM) techniques such as pond and washland creation, hedge and tree planting, will help to greatly reduce flood peaks and to slow the flow of water downstream, providing benefits to both people and wildlife. 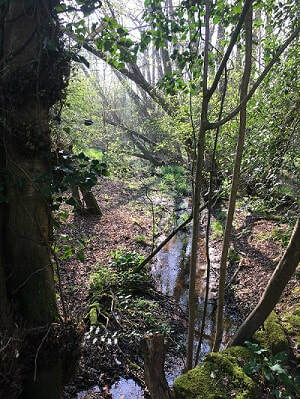 Sussex Flow Initiative is excited to be working with communities, landowners and local parishes in the area to help make the Powdermill stream sub-catchment more water resilient, more flood resilient, to improve habitats for wildlife and to increase woodland cover . 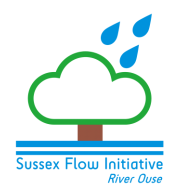 ​If you would like to know more about this project, please contact the Sussex Flow Initiative Project Officer for the catchment, Rina Quinlan, at sussexflowinitiativepm@gmail.com or 07595 452038. Sussex Flow Initiative (SFI) is a Natural Flood Management project based in Powdermill Catchment, Crowhurst. SFI is a partnership between Environment Agency, Sussex Wildlife Trust and Woodland Trust. Together, we work with communities, landowners and local parishes in the area to help make the Powdermill stream sub-catchment more water and flood resilient and improve habitats for wildlife. Join us for a short presentation by Rina Quinlan, Powdermill Project Officer on the work that SFI is doing in the local area.